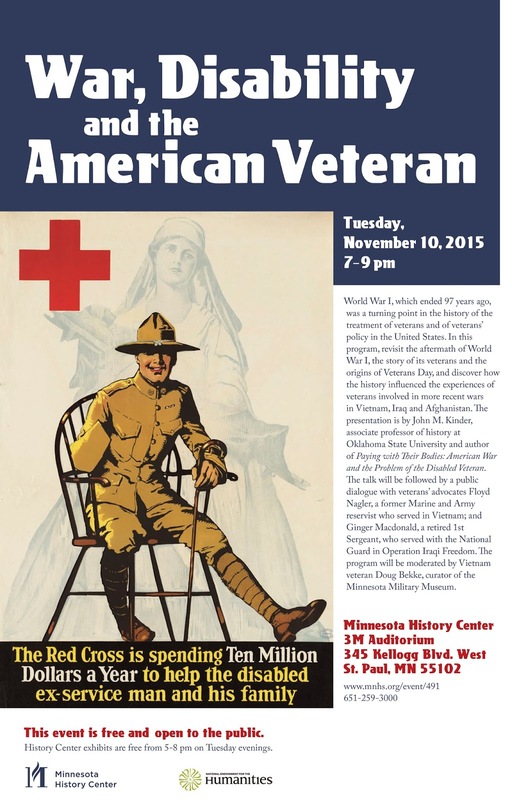 In recognition of Veterans’ Day, I will be delivering a lecture at the Minnesota History Center in Saint Paul, MN. A question-and-answer session — and a book-signing — will follow. All are welcome. The Great War–which ended 97 years ago–was a turning point in the history of the treatment of veterans and of veterans’ policy in the United States. Revisit the aftermath of World War I, the story of its veterans and the origins of Veterans Day, and discover the light their history sheds on the experiences of veterans who have paid with their bodies in the nation’s more recent wars in Vietnam, Iraq and Afghanistan. With presentation by John M. Kinder, Associate Professor of History, Oklahoma State University and author of Paying with Their Bodies: American War and the Problem of the Disabled Veteran, followed by a public dialogue with contemporary veterans moderated by Doug Bekke, director of the Minnesota Military Museum.